You can check details of the installed license in the License Information window. On the toolbar, click Help and select License Information. The License Information window will display license details. 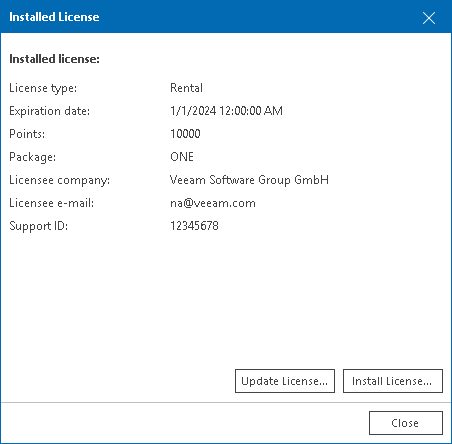 License status — status of the installed license (Valid, Valid (License key is about to expire), Invalid, Expired (N days of grace period remaining), Warning (License exceeded), Not Installed). Expiration date — date when the license will expire. [For Perpetual license only] Support expiration date — date when the license will expire. To see detailed information about the installed license file, click the View installed key link. License type — type of the installed license (Perpetual, Subscription, Rental, Community, Evaluation, NFR). Edition — license edition (Standard, Enterprise, Enterprise Plus). Instances — number of instances that can cover managed objects. Monitoring — indicates if monitoring is enabled for objects that the license covers. Licensee company — name of the user or company to which the license was issued. Licensee e-mail — email address of contact person in a company. License administrator e-mail — email address of the license administrator in a company. Licensee first name — first name of the contact person. Licensee last name — last name of the contact person. Sockets — number of sockets that the license covers. Support expiration date — date when support contract will expire. Support ID — customer identification number required when contacting Veeam technical support. 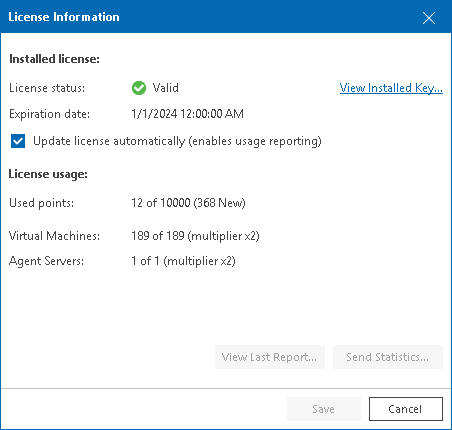 The License usage section provides details on the number of currently managed VMware vSphere and Microsoft Hyper-V VMs and sockets, and the number of instances that the managed objects consume. Used sockets — number of sockets on managed VMware vSphere and Microsoft Hyper-V hosts. Used instances — number of instances consumed by managed objects out of the total number of instances available in the license. New instances — number of instances consumed by objects that were discovered less than a month ago (within the current calendar month). For details on new objects, see Licensed Objects. Monitored agents — number of managed Veeam Agents discovered on Veeam Backup & Replication servers connected to Veeam ONE. Monitored VMs — number of managed VMs out of the total number of discovered VMs on managed VMware vSphere and Microsoft Hyper-V hosts and Veeam Backup & Replication servers.